The latest web browser introduced by Microsoft, The Edge, is the default browser of Windows 10. Even if you have Chrome or Mozilla as your default browser in previous version of Windows, when you upgrade to Windows 10, Edge will be made your default browser. Edge has certain features that are superior to Internet Explorer, but shows certain flaws in function. This browser is swifter and spontaneous than IE, but certain extensions that functions well in Chrome and Mozilla, seems to be functionless when applied to Edge. So inorder to have full operational capacity this might need future updates. In the meantime users can alter their default browser to a browser of your choice. You have to type Default Browser on the search tag and press the Enter Key. Alternatively you can you can click and select Choose a Default Browser from the top of the search results that you have done in Windows. 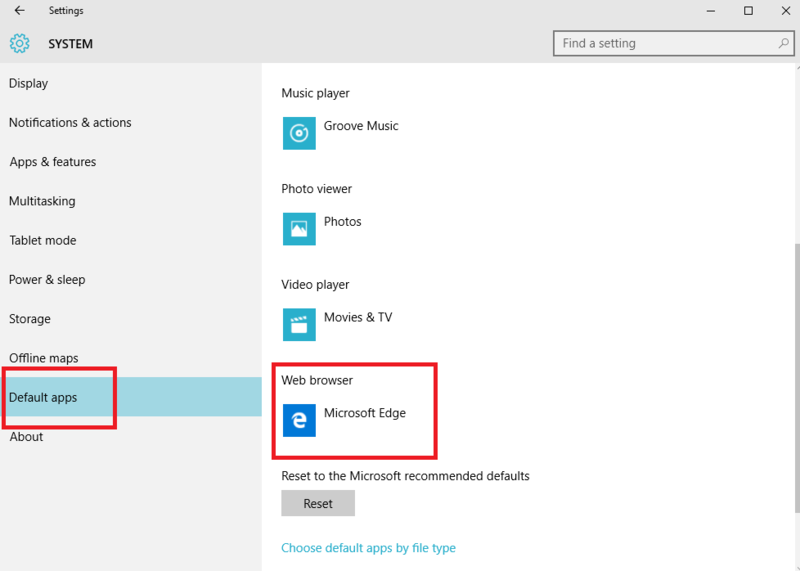 This will take you directly to the Settings>> Settings>> Default Apps and finally to the web browser that is already available as default in Windows 10, The Microsoft Edge. If you want to alter this then you have to click and select Microsoft Edge. This will pop up a window showing the list of other browsers that you have installed in Windows 10. From there you have to select a web browser of your choice and close down the window. Now you are done with altering your default web browser. Now onwards when you try to open your email, the web browser which will be showing will the one you have selected and not the Edge. The above mentioned steps are intended to those users who have opted for free update of Windows 10 from their previous versions of either Windows 7 or Windows 8 or Windows 8. If you have performed a fresh installation of Windows 10, then you may have to download the web browser of your choice to make it default. Also when you open the web browser that you have selected as your default browser, you will be encountered with a dialog box asking to set the currently opened browser as default one, which you should have to confirm. Otherwise the older browser will be continued to be used as the default one. What Microsoft wants that its users must be using their products. They will definitely alter your default browser to Edge during the process of upgrade. But still they provide the users with an option to alter this and choose according to the comfort of each user. This is quite simple to alter the default browser, just need a few steps to follow. Even though Microsoft wants its users to use everything they provide, by the same time they provide the users with certain options to customize those settings also. How to Personalize Location Tracing in Windows 10?